As any sustainability savvy traveler knows, satisfying wanderlust comes at a steep price to the planet. Unless it's the kind done on two wheels or two feet, travel – especially via airplane – means a heavy carbon footprint, as well as disruption to ecosystems, habitats, and indigenous communities. So in honor of Earth Day (and Earth Month) 2011, here are three adventure-travel companies that are truly setting a green example by helping protect the places (and people) they visit – and inspiring fellow travelers to do their part, too. Intrepid Travel: Since 1989, Intrepid travel has been catering to adventurers craving an authentic, off-the-beaten path experience. At the same time, the company also understands that by promoting travel, it has a higher responsibility to promoting sustainability. In 2010, the company announced that it is 100 percent climate neutral and will continue to be moving forward. To achieve this, Intrepid purchases carbon offsets for the majority of its trips (at cost, which is about 66 cents per day, according to the company's website) and encourages travelers also to purchase a carbon offset for their flights. 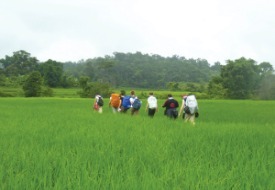 In addition, the company promotes a philosophy of responsible travel in all of its customers and contributes to conservation efforts in many of the dozens of countries (like Thailand, shown at right) where it has trips. Ready to impart some green-minded lessons on your little travelers? The company is offering discounts of 15 percent for children and five percent for adults on Family Group Adventure Trips booked through April (travel good through January 2012; use promotion code 5960 when booking; www.intrepidtravel.com). Wildland Adventures: Simply put, this Seattle-based ecotourism group, which has garnered multiple industry awards and "best-of" designations by numerous media outlets, does sustainability right – and has since it was founded in 1986. Wildland works closely with (and is a member of) a slew of global conservation and environmental groups and is considered the gold standard in ecotourism circles for its unwavering commitment to planet- and community-centric practices. Among them: employing local guides, educating travelers about environmental and cultural issues in the countries they're visiting, and fostering the donation of money and goods to communities and conservation groups. Wildland (www.wildland.com) offers trips all over the world (like this safari in India, shown above), but the company has a special focus on Costa Rica, as founder Kurt Kutay spent time in the country as a park ranger. Escape Adventures: If anyone deserves a giant green star for its sustainability efforts, it's this Las Vegas-based outfitter, run by husband-and-wife team Jared and Heather Fisher. All of Escape Adventure's (www.escapeadventures.com) support vehicles are powered by vegetable oil or biodiesel, its Moab Cyclery bike shop is run on solar power, and the company recycles more than 90 percent of the waste generated on each tour, offsetting the remainder with the purchase of renewable energy and energy efficiency projects. And the trips? Well, they're enough to make any adventure junkie green with envy. Though EA's passion is mountain biking, with plenty of offerings throughout the West and Midwest (think the Grand Canyon's North Rim or singletrack in Idaho), you can also choose from hiking and multi-sport adventures in places like Belize, Guatemala, and Panama.